Note: Kit and protocol have been updated. Please visit Protocols & Manuals tab for details. The EnGen sgRNA Synthesis Kit, S. pyogenes provides a simple and quick method for transcribing high yields of sgRNA in a single 30-minute reaction, using the supplied reagents and target-specific DNA oligos designed by the user. The EnGen sgRNA Synthesis Kit, S. pyogenes provides a simple and quick method for transcribing high yields of sgRNA in a single 30 minute reaction, using the supplied reagents and target-specific DNA oligos designed by the user. In nature, S. pyogenes Cas9 is programmed with two separate RNAs, the crRNA and tracrRNA. The crRNA, or CRISPR RNA sequence contains approximately 20 nucleotides of homology complementary to the strand of DNA opposite and upstream of a PAM (Protospacer Adjacent Motif) (NGG) sequence. The tracrRNA, or transactivating crRNA, contains partial complementary sequence to the crRNA as well as the sequence and secondary structure that is recognized by Cas9. These sequences have been adapted for use in the lab by combining the tracrRNA and crRNA into one long single guide RNA (sgRNA) (1) species capable of complexing with Cas9 to recognize and cleave the target DNA. The EnGen sgRNA Synthesis Kit, S. pyogenes combines an S. pyogenes Cas9-specific Scaffold Oligo (included in the EnGen 2X sgRNA Reaction Mix) that is partially complementary to the target-specific oligos designed by the user. The two oligos anneal at the overlapping region and are filled in by the DNA polymerase, creating a double-stranded DNA (dsDNA) template for transcription. Synthesis of the dsDNA template and transcription of RNA occur in a single reaction, resulting in the generation of a functional sgRNA. 1. Jinek, M. et al. (2012) Science 816–821. PubMed ID: 22745249. Figure 1: General workflow for the EnGen sgRNA Synthesis Kit, S. pyogenes. A. The target-specific oligo contains the T7 promoter sequence, ~20 nucleotides of target-specific sequence and a 14 nucleotide overlap sequence complementary to the S. pyogenes Cas9 Scaffold Oligo supplied in the reaction mix. Target-specific oligos (or EnGen sgRNA Control Oligo, S. pyogenes) are mixed with the EnGen 2X sgRNA Reaction Mix (NTPs, dNTPs, S. pyogenes Cas9 Scaffold Oligo), 0.1 M DTT and the EnGen sgRNA Enzyme Mix (DNA and RNA polymerases) at room temperature. B. At 37°C the two oligos anneal at the 14 nucleotide overlap region of complementarity. C. The DNA polymerase extends both oligos from their 3´ ends creating a double-stranded DNA template. D. The RNA polymerase recognizes the double-stranded DNA of the T7 promoter and initiates transcription. The resulting sgRNA contains the target-specific/crRNA sequence as well as the tracrRNA. All steps occur in a single reaction during a 30 minute incubation at 37°C. Figure 3: Examples of sgRNAs synthesized using the EnGen sgRNA Synthesis Kit, S. pyogenes and multiple different target-specific oligos including the EnGen sgRNA Control Oligo, S. pyogenes. RNA was run under denaturing conditions on a 10% Novex TBE-Urea gel and post-stained with SYBR Gold. The yield of my sgRNA is low – what can I do to improve the yield? 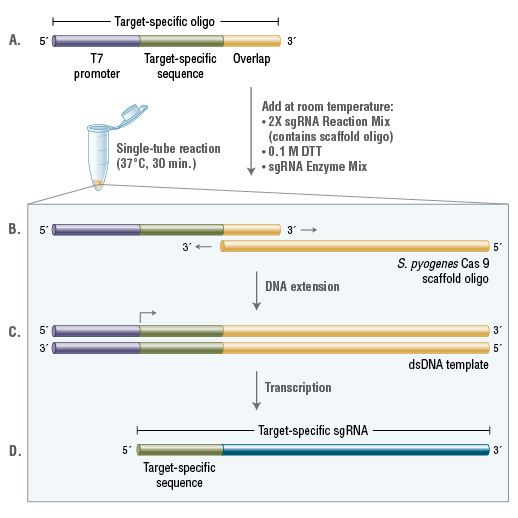 Is it necessary to add a “G” into the oligo following the T7 promoter sequence? Is it necessary to DNase treat my sgRNA synthesis reaction? Why is my sgRNA not exhibiting 100% in vitro Cas9 cleavage activity? Is it necessary to phosphatase treat my sgRNAs? 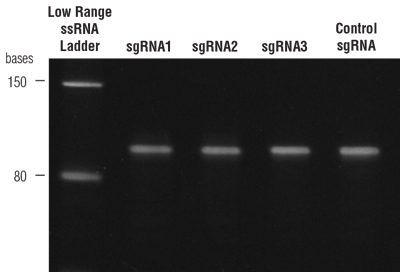 The sgRNA is not running as a single band on the gel – why is this happening? Will the sgRNAs synthesized from this kit (NEB #E3322S) be recognized by homologs of Cas9 from different organisms? Do I include the PAM(NGG) in my sgRNA sequence? What is the sequence of the control oligo provided with the EnGen sgRNA Synthesis Kit, S. pyogenes? ​Is it necessary to add the provided DTT to the sgRNA synthesis reaction? Evan A. Boyle, Johan O.L. Andreasson, Lauren M. Chircus, Samuel H. Sternberg, Michelle J. Wu, Chantal K. Guegler, Jennifer A. Doudna, and William J. Greenleaf (2017) High-throughput biochemical profiling reveals sequence determinants of dCas9 off-target binding and unbinding PNAS; 114, 5461-5466.